Name: A name for the entire project. This should be a symbol not naming any other project. This symbol is used to name the .exe, .dxl, and certain other files that are created by the File | Build Project Distribution and File | Build Project Executable commands. The name also appears in the title-bar of the IDE, and may be passed to find-project to find the project if it has been loaded with load-project or open-project. Using a keyword for the name is recommended. The project name could be retrieved or set programmatically by calling name or (setf name). Package: Names the default package for source code that is auto-generated for the forms of the project. This value should be a keyword symbol that names a new or existing package, and this widget will coerce a value that is entered here to a keyword symbol. It is simplest to continue using the common-graphics-user package (the default), but another package may be used if desired. If the value entered does not name a package, a new package is created automatically with that name. In any case, a basic defpackage form will be written into the generated .lpr project definition file for this project, to ensure that the package will always exist before it is needed. This defpackage form will use the cl, excl, and cg packages, and will export any symbols that are known to be exported from the package. You may add a more complete defpackage form elsewhere in the project code if needed; the package will then be augmented rather than replaced, as usual when there are multiple defpackage forms for a package. 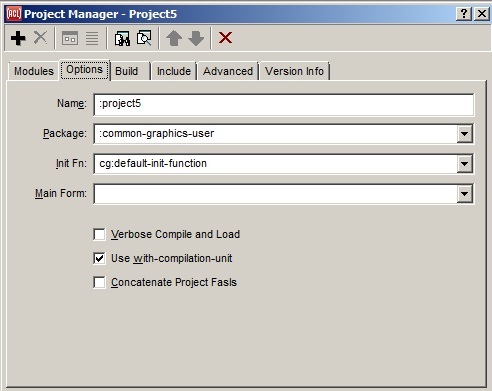 See project-package-name and form-package-name for more information. Init Fn: The function that is run when the Run | Run Project command is invoked, or when the standalone application that is generated from the project is started up. The value must be a symbol naming a function that takes no arguments. The function should perform whatever initialization is needed, including creating any windows that should be displayed initially. If it returns a window, the application will run until that window is closed; otherwise the application will exit when the init function returns. The default init function simply creates the running window of the project's main form and returns it. See on-initialization, default-init-function, finder-function, and maker-function for more information. Main Form: The form that is run by the default initialization function when the Run | Run Project command is invoked or the standalone application that is generated from the project is started up. This form is also indicated on the General tab by a special "moving window" icon. See main-form. Verbose Compile and Load: whether *compile-verbose* and *load-verbose* are bound to true when the project is compiled and loaded. See ide:verbose. Use with-compilation-unit: whether the entire project is compiled inside a with-compilation-unit form, which avoids warnings about called functions that are defined in later modules, for example. See ide:compilation-unit. Concatenate Project Fasls: specifies whether compiling the project will produce a single fasl file that contains all of the project code (this will happen when checked). This single file could then be loaded into a development Lisp to use the application in that Lisp, without opening the project for further development. See concatenate-project-fasls. Note that you cannot have a source file with the same name as the project if you choose this option.